My name is Duncan Henderson. My firm is called Inverness Legal Services for Criminal Advocacy. I represent clients in criminal cases in Court as a solicitor. 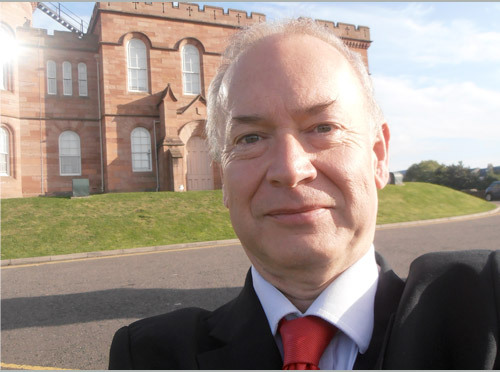 I have over 31 years of practice in the Courts and nearly 17 years running my own criminal defence firm in Inverness. I graduated from Edinburgh University in 1985 and completed my Diploma in Legal Practice in 1986. I trained in the Highlands and enrolled as a solicitor in 1987. I have been appearing regularly in Court since then and have over 30 years of court experience both in defence and prosecution. I became a Notary Public in 1989. I joined the RAF as a lawyer in 1992 graduating from RAFC Cranwell with the course prize (being the first lawyer to achieve this). I served the 5 years of my short service commission in London, Germany and latterly as a prosecutor in the UK. I also undertook defence work for army personnel including PACE interviews. During that time I cross-qualified as an English Solicitor and became an English Solicitor-Advocate (Higher Courts (Criminal))in 1996. I also met and married my wife, Sarah. We have two children. I returned to Scotland to take up an appointment as a Procurator Fiscal Depute in Glasgow in 1996. Most of the next 2½ years were spent in the busiest Courts in Europe conducting trials covering all types of criminal cases. I transferred to Inverness as a Procurator Fiscal Depute in 1999. I recommenced private practice in 2001. I set up my own firm undertaking criminal defence work in 2002. I now have over 16 years experience of running my own criminal defence firm. I am registered to provide criminal legal aid with the Scottish Legal Aid Board. I only undertake criminal work. I have been involved in a wide range of cases from the High Court through to JP Court covering many aspect of criminal law (including appeals when required). I have served a number as a member of the Deans Council of the Highland Faculty with a particular interest in criminal law. In January 2012 I was a speaker for the Cadder Road Show organised by the Law Society of Scotland. In 2014 I became a peer reviewer with the Scottish Legal Aid Board. My wife, Sarah Henderson is my office manager. Although she initially trained as a nurse and a midwife (skills which still come in useful when reading medical notes):she now works full time for me since 2004. She is both a accredited criminal paralegal and law accountant bringing those skills to the administration of the office. Outside work I was the vice chair of the secondary school's Parent Council for 7 years and currently represent two clubs at of the Inverness Area Sports Council. In my spare time I have a number of interests including computer games, martial arts (where I hold black belts in aikido and karate) and outdoor sports (where I am a level 3 instructor inland and sea kayak). I am also qualified in first aid.